Harvard alums (photo 1) listened as President Drew Faust gave the welcoming remarks at Harvard Black Alumni Weekend on Oct. 10. Faust later posed for photos (2) at the event, which drew 700 participants. Applause and a standing ovation at the Memorial Church marked one of the many discussions during the three-day gathering (photo 3). It was described as a historic event as hundreds of black alumni from across generations gathered at Harvard University over the weekend, many representing its graduate Schools. “This is an opportunity for African-American alumni from across all of Harvard’s 14 Schools to come together, not only for fellowship, but also to exchange ideas and really engage in today’s issues,” said Lawrence Adjah ’06, president of the Harvard Black Alumni Society. 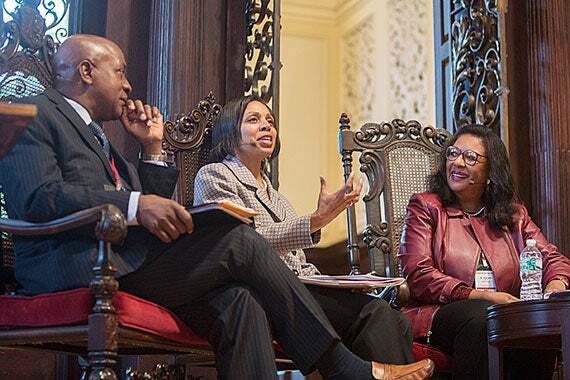 Harvard Black Alumni Weekend 2014 (Oct. 10-12), the fourth such gathering since 1999, was only the second time that it has been open to graduates of all Schools. In the past, events for black alumni were organized by the societies of one or several Schools at a time and focused on undergraduate students. The Harvard Black Alumni Society, one of 46 Shared Interest Groups for Harvard alumni, organized this year’s event with the help of the Harvard Alumni Association. With the conference open to all graduates this past weekend, more than 700 people participated in three days of events and discussions focused on reconnecting — or connecting for the first time — alumni to the University and to each other. Harvard President Drew Faust in her opening address at the conference, Friday evening, recognized another touch of the event to Harvard’s long history. “We have a lot to celebrate,” said Faust. “One hundred and fifty years ago this year, Harvard’s time without black students came to an end, beginning a trail of milestones at once unimaginable — you all being Exhibit A, with the nearly 10,000 black alumni of Harvard. A lot has changed,” she added. The Class of 2018 includes students from 69 countries and every state in the union. It also represents a class with the most African-American students in the University’s history. The accomplishment is in part because of ongoing recruitment and increased financial aid to undergraduate students, Faust said. But in recognizing the significant change for African-Americans at the University and across the nation over history, Faust said many challenges still remain to be solved. Only one in 10 of the Harvard faculty are black, Latino, or mixed race. And many students of color say that even if the student body is more diverse, they still struggle with challenges of inclusion and connectivity to the University. The Harvard experience for every student is unique and challenging. But for black students there are added challenges of race and culture. Kimberly Willingham, Ed.M. ’96, said she felt a strong connection to her college friends and to the Harvard Graduate School of Education, but not so much to the University as a whole. In the nearly 20 years since her graduation, she has not felt an incentive to stay connected with Harvard because of her experience on campus. Her friend and classmate Christina Brown, Ed.M. ’96, said she also struggled connecting with the University when she was a student, as well as an alumna living in the Boston area. “I’m interested to see where Harvard is in terms of race and diversity,” she said about the conference. The weekend featured a series of panel discussions spanning topics from the current events surrounding the shooting of a young black man in Ferguson, Mo., to fashion, technology, entrepreneurship, and activism. The opening panel discussion of the weekend focused on important issues of diversity and improving connections between the University and students and alumni. On Saturday morning hundreds of people filled the pews of the Memorial Church for the discussion. The panelists included Charles Ogletree, professor at Harvard Law School; Karen Jackson-Weaver, senior associate dean for degree programs and student affairs at Harvard Kennedy School; David L. Evans, senior admissions officer for Harvard College; and Abigail Mariam, a senior at the College and a liaison for the “I, Too, Am Harvard” campaign. Jacqueline Adams, M.B.A. ’78, an Emmy Award–winning former correspondent for CBS News, moderated the conversation. The challenge of improving diversity on the Harvard campus involves not only increasing the number of black students in undergraduate programs, but also making sure those students come from diverse economic and social backgrounds, panel members said. However, the task does not end at graduation. The measure of diversity on the Harvard campus as a whole is also a function of diversity in the ranks of the faculty, administration, and staff, they concluded. A key to solving these problems, said Evans, is encouraging more students of color to pursue graduate studies so they can become the professors, researchers, and university administrators of the future. The University, he said, needs to identify and work with students who show potential for graduate programs and make sure they are aware of the many financial assistance programs available to them. “We have to give them the confidence to apply,” said Evans. But the progress on campus is also related to the state of race relations off campus and across the United States. The nation elected its first African-American president, and there are more opportunities for black men and women in academia and the job market. But in many ways, the fight for equality continues. And that point for panel members was made very clear with the recent fatal shooting of 18-year-old Michael Brown by a Missouri police officer. Ogletree said that when he leaves campus, many people, including police, see him as just another black man. He said he was recently a victim of racial profiling in California, where he was stopped by an officer for apparently no other reason than driving a luxury SUV in a troubled neighborhood. The idea behind Harvard Black Alumni Weekend is to help foster these types of in-depth discussions about difficult issues and to build a network that will lead to change on and off campus.